22 • WRAPS • 2 0 1 8 wrap-shop. Duever also suggests avoiding locations with too much rent or overhead. "It's best not go full in right out of the gate and buy a ton of equip- ment and hire a large staff," says Pate, who started the Wrap Institute in 2014. "Start off big enough to get the ball rolling and see where the customer base leads the growth, then build from there." One way to start small is to outsource one or two of the steps of the process. "A good tip is to outsource the printing at the beginning," Pate says. "This way, instead of diving into the printing process yourself, see if it's something that can sustain itself rst." STAFF TRAINING For the steps they do in-house, wrap shops will need to make sure their staff gets the proper training and certication. They can access resources through lm manufacturers like 3M, Avery Dennison and Orafol, or sign up for classes and training seminars of- fered by lm and printer manufacturers and institutes, such as the Wrap Institute. For instance, Pate was part of the Avery Dennison Business Boot Camp launched in mid-May that explains how to run a wrap shop, including stafng, workow, production, printing, installation and marketing. "It's all about doing your homework," Pate says. "It's extremely important to take workshops and watch videos to get the skills you need and to avoid mistakes." There are other forms of training, such as learning about the cor- rect lms to use and preferred techniques for various surfaces and contours, Sumner says. Installers need to know where the lm will be stretched and how to accommodate door handles and other obstruc- tions and any areas where it cannot stick to surfaces, plus how to keep logos straight, he says. "You need to panel it and line it up like a puzzle," Steve Carney says. "There are different techniques and levels of training needed for each style of the wrap." 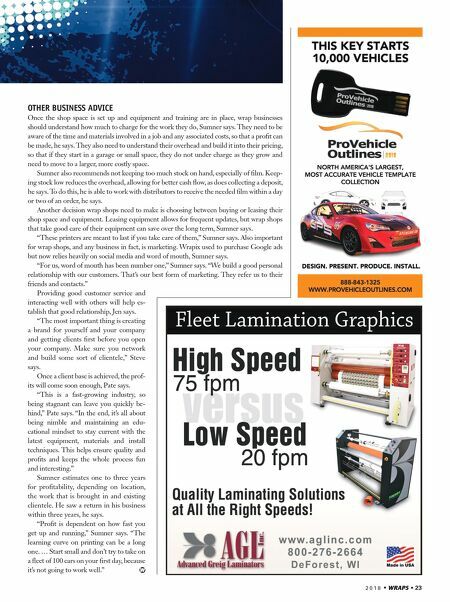 WRAP SHOP PRIMER BUSINESS & SALES WHAT DOES IT TAKE TO ENTER THE WRAP INDUSTRY TO OFFER WRAPS FOR VEHICLES, BUILD- INGS AND OTHER SURFACES? • ESTIMATED COST OF ENTRY: Expect to spend $40,000 to $85,000 on equipment, plus the costs of leasing or buying a shop space, hiring staff and covering other over- head expenses. • BASIC EQUIPMENT NEEDS: Expect to spend $25,000 to $60,000 on a printer, $8,000 to $10,000 on a laminator, and $7,000 to $15,000 on a plotter. Additional tools that will be needed include knives, tape or magnets, squeegees and a heat gun. • SHOP SPACE REQUIRED: Opt for 800 square feet for a production room to house the equipment and another 200 square feet for office space. But as little as 300 square feet can be sufficient for production, sales and staff. • TIME NEEDED TO TURN A PROFIT: Aim for 1-3 years, though the exact timeframe for profitability is hard to predict. Top: A Lamborghini Murcielago gets a satin black finish with a 3M 1080 Satin Black wrap installed by Carbon Wraps in Orlando, Florida. 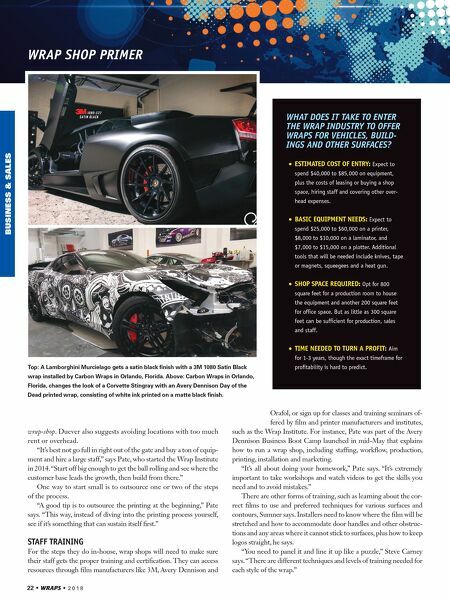 Above: Carbon Wraps in Orlando, Florida, changes the look of a Corvette Stingray with an Avery Dennison Day of the Dead printed wrap, consisting of white ink printed on a matte black finish.